Our starting point in Japan was the awesome city of Osaka. We absolutely loved it here, even though it might not be the most popular tourist destination in Japan. We’ve spent 12 whole days in Osaka, the most time we spent in one place in Japan. Osaka is a city with lots of activities, great restaurants and of course amazing hotels. In this article we share eight fun things to do in Osaka. 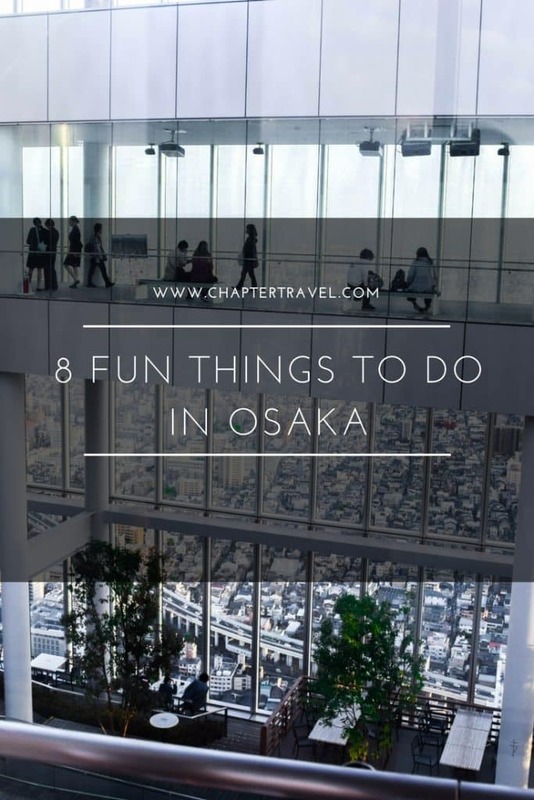 Besides these fun activities we also share some facts about Osaka, a little bit about the history, tour recommendations and a great hotel recommendation. Scroll down for eight fun things to do in Osaka! Osaka, one of the biggest and most populated cities in Japan, is located on the main island of Honshu and in the region of Kansai. The city’s population counts roughly 2.7 million people and is spread across 221 square kilometres. Remarkably, the population of Osaka accounts for 7% of the nation’s population. With the nicknames the Nation’s kitchen, Japan’s kitchen and The Food Capital of Japan it’s not a surprise that Osaka is best known for delicious food. Back in the day, Osaka served as a centre for the rice trade. Nowadays, the city is renowned for it’s delicious cuisines and has over 100 Michelin star restaurants. Thus, the nicknames refers more to its reputation as a paradise for food. The most famous dish in Osaka is the okonomiyaki, which is a savoury pancake. Osaka has a rich history, which can be tracked back for over 1400 years. In the fifth century, Osaka was an economic and political centre, because of the access to the sea. In the 14th century, there were a series of civil wars that led to the devastation of the area. Later, much of the city was rebuilt and during the Edo period (from 1601-1867) Osaka became Japan’s kitchen. In 1868, Osaka became a commercialised area, and a lot of factories were built. This led to a new nickname: smoke city. By 1925, Osaka was Japan’s largest city in terms of population and area. Today, Osaka can be considered the economic heart of Western Japan with companies across business, industry and commerce. 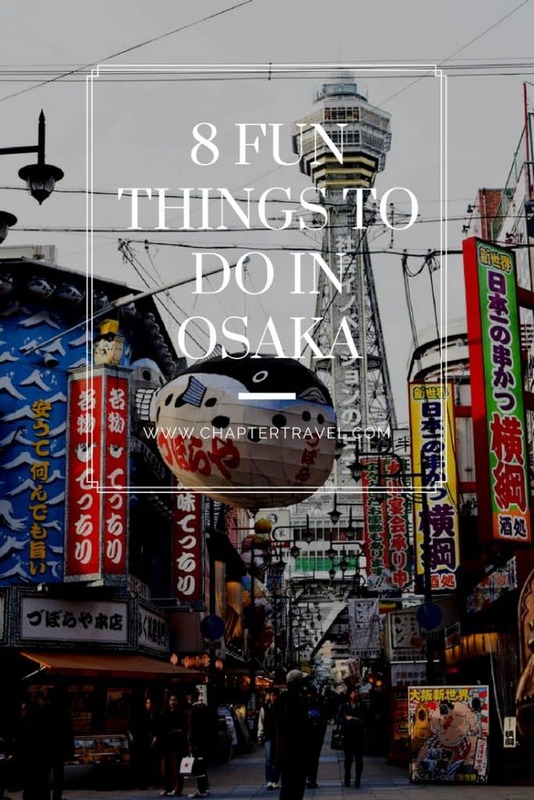 Below we’ve listed 8 fun things to do in Osaka! 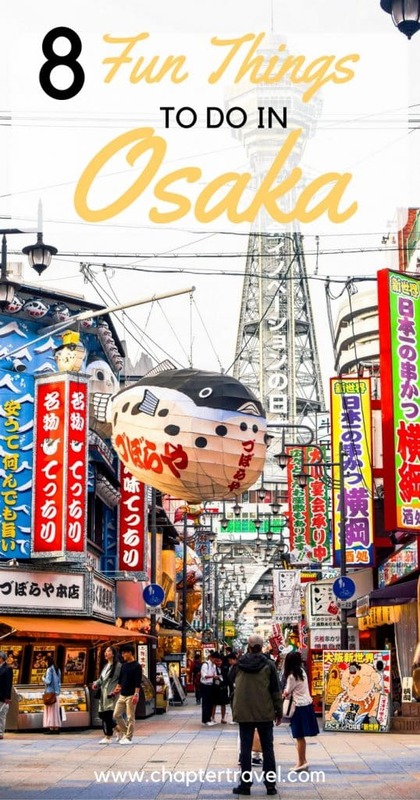 If you’re looking for more fun things to do be sure to check out Osaka on TripAdvisor to get more inspiration. Or get the Lonely Planet Guide about Osaka for a lot of useful information. You can buy the Pocket Kyoto & Osaka Travel Guide from Lonely Planet here. Dotonbori is a popular, colourful district in the Namba area and runs parallel to the Dotonbori-gawa canal. We think it’s worth going here both at daytime and at nighttime. Already during the day it’s a vibrant place with loads of shops, restaurants, bill boards and crazy signs. These crazy huge signs include giant crabs, fish, dragons and sushi. In Dotonbori you can also find one of the most famous neon bill board sign in Japan; the Glico billboard of the runner crossing the finish line. Especially during the nighttime the streets come alive with lights and big neon signs. Once the sun sets, all the lights illuminates the streets, and it also gets a lot busier. We seriously loved this place, there is so much to see and do. Like almost everywhere in Japan, you feel like you’re a kid in Disney World. Even if you’re not looking for shops or restaurants, it’s just worth it to walk around and take it all in. But, if you are looking for great local food, Dotonbori is definitely one of the places you can find it. For instance, why not try takoyaki – dough balls with octopus? Another great idea is to try out some ramen, as we had some delicious spicy ramen at one of the local restaurants here. There are so many great food places and different dishes you can try – so bring your appetite! 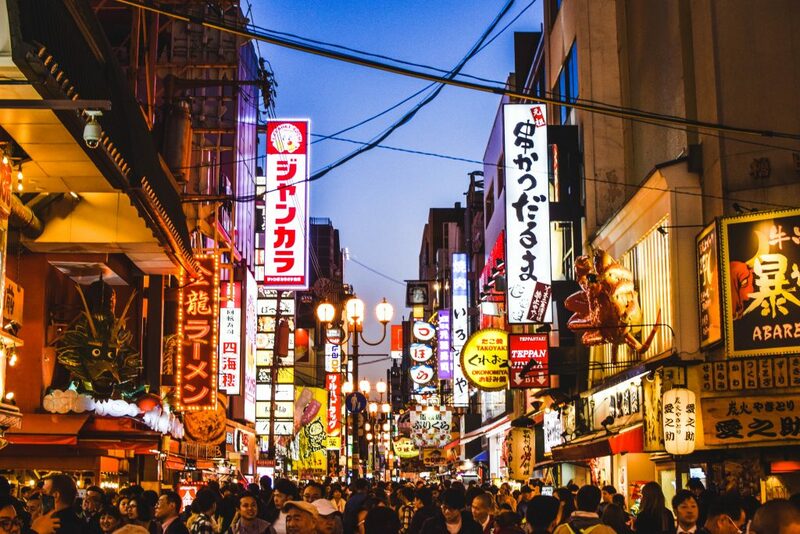 Check out this cool tour that lets you discover all the tasty Japanese snacks in Dotonbori! It takes you to all the old backstreets and markets of Osaka and you get to taste famous Osaka treats, such as kushi-katsu and takoyaki octopus balls. Address: Dotonbori , Chuo Ward, Osaka, Osaka Prefecture 542-0071, Japan. 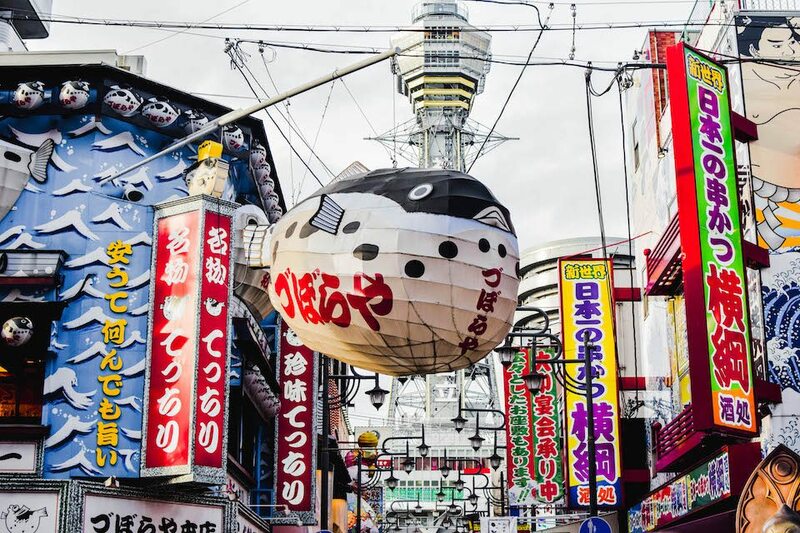 Just like Dotonbori, the neighbourhood of Shinsekai is a remarkable and fun place to walk around. Here you find big quirky advertising props like a huge blowfish latern or other 3D models of various food and sea creatures. One difference we found with Dotonbori is definitely that Shinsekai is less crowded. Meaning “New World”, Shinesekai was opened in 1912 and was meant to resemble New York and Paris. At Shinsekai it is possible to see Tsutenkaku Tower, which stands in the center of the area. At the time the Tsutenaku tower was the second highest building in Asia. In the 90s this area got a bad reputation, and it is still considered to be one of the most dangerous areas in Osaka. But, Japan is really one of the safest places in the world. Compared to most places worldwide, Shinsekai is not dangerous at all. The area has remained untouched over the years, giving it a sort of retro vibe. For instance, the advertising in the streets are still in the Japanese 60s style. Plus, it is possible to find lots of traditional Japanese restaurants. Address: 556-0002 1-chome to 2-chome Ebisuhigash, Naniwa-ku, OsakaCity. The Osaka Castle Park is worth a visit if you like pretty fairytale-like castles with beautiful mint-coloured details. 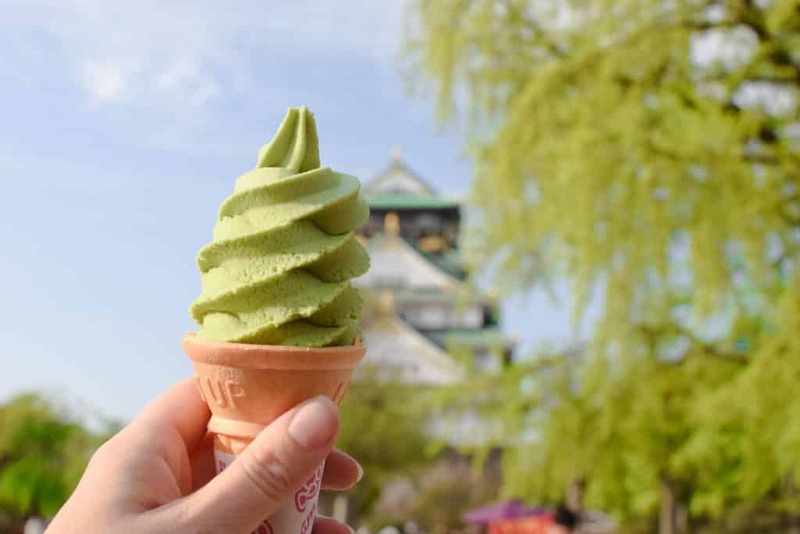 It’s free to visit and you can get different food (yay, matcha ice cream!) at various stands opposite the castle. Actually, the castle you can visit is not the original one, and the real Osaka Castle has quite a long history. The construction already started in 1583, it has faced destructions over the years and was even struck by lightning and burned down in 1665. In 1931 the present Osaka Castle was built. reconstructing the look of the original one. We didn’t go inside, as we didn’t feel like buying a ticket and standing in a line to get in. Also, we read that the inside of the castle is very modern, which is a bit disappointing if you want to see a traditional interior. Next to the castle there was an elevator, which was also a bit disappointing. It ruins the aesthetics of the gorgeous traditional architecture. Luckily, you didn’t see the elevator from every perspective. Interested in to learn more about the history of Osaka? Or have some amazing views over the city? This tour by Get Your Guide teaches you all about the history of Osaka. 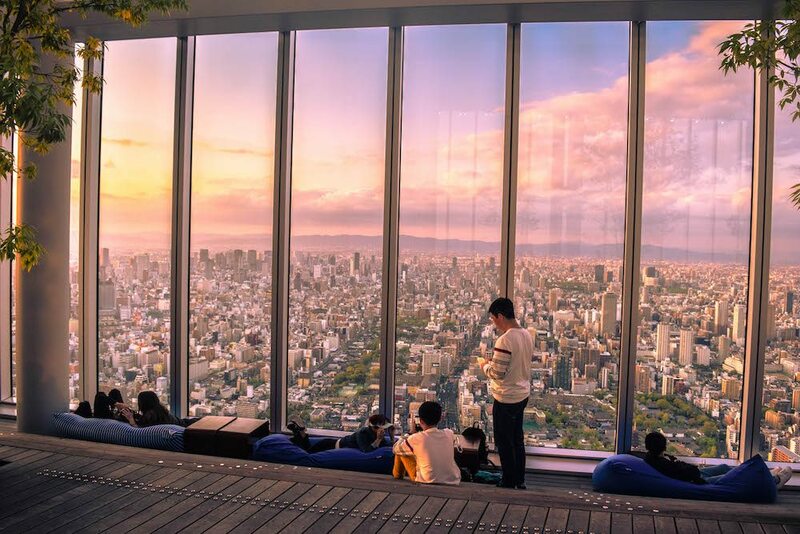 Even better is that you get an panoramic view of Osaka at the Floating Garden Observatory and it takes you on a riverboat with more breathtaking views of the city. Address: 540-0002 Osaka, Prefecture, Osaka, Chao Ward. When we came across a photo of this waterfall, we knew we wanted to go there. Although we enjoy the city life, we love green and lush places more. Minoo Park is the closest area to Osaka where you can find a forested valley. It’s a great place to visit if you’re looking for a serene place and need to breath in some fresh air. The main hiking trail is about three kilometres alongside the Minoo River. 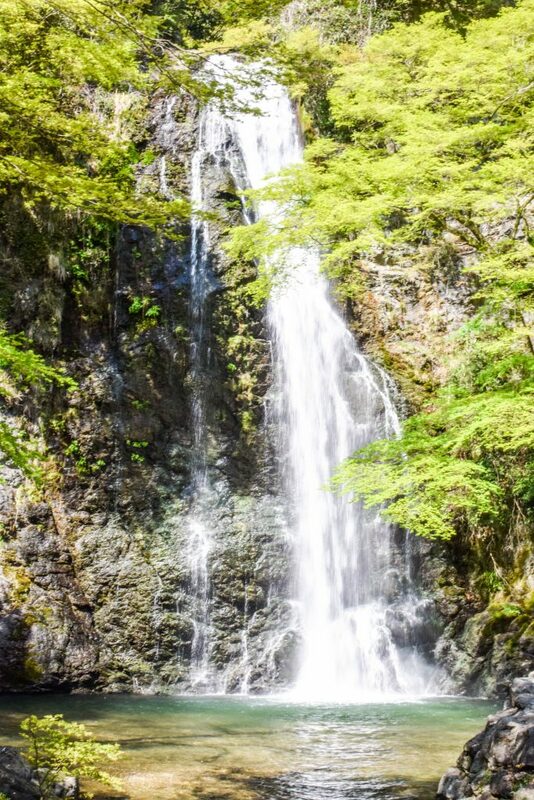 It leads to the Minoo Waterfall that is pictured above. The trail is easy and only takes about 30 to 45 minutes (one way). The elevation is not steep at all, so it’s just a walk in the park. There are also other trails you can follow, some that go into the hills beyond the waterfall. Address: 562-0002 Osaka Prefecture Minoo, Minookeon. Abeno Harukas is the tallest skyscraper in Japan. 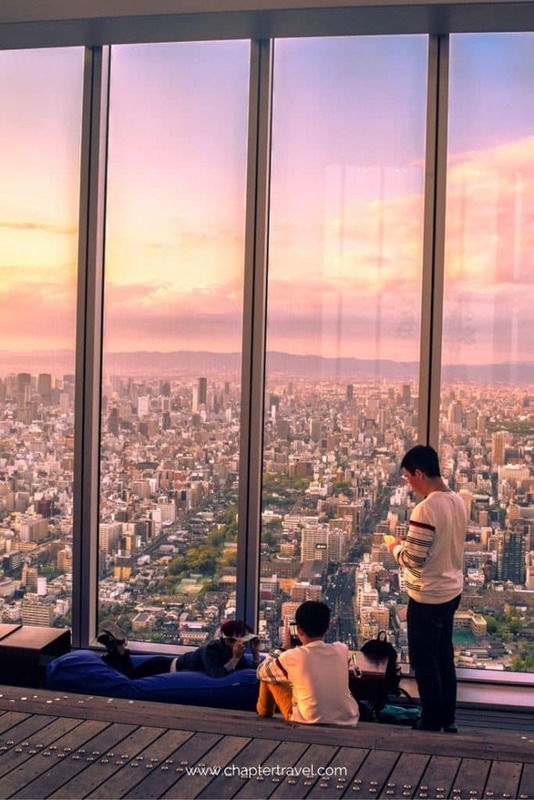 Besides that it houses Osaka Marriott Miyako Hotel, here you can also find an amazing observation deck called the Harukas 300. 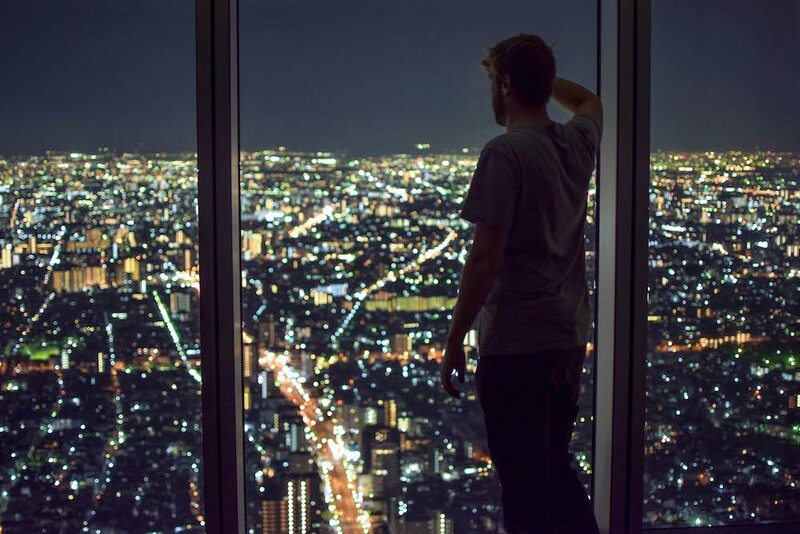 This observation deck is located on the top three floors, floor 58 to 60, and can be accessed from the 16th floor. We went there during the sunset, and had the most amazing view. On the 60th floor you have a 360 degree view over Osaka, and on the 58th floor there is an inner court with wooden deck. When we were there, people were relaxing on fat boys at the window, you can see this on the photo above. Also, there is a cafe where you can grab some food and drinks, and a souvenir shop and restrooms. Address: 545-0052 Osaka Prefecture, Osaka, Abeno Ward. Yes, that’s Jeffrey in the background! Nara Park is definitely one of the main day trips from Osaka. The reason for this is definitely the countless of free roaming deer. These deer are considered to be messengers of god, according to the indigenous fait of the Japanese people (also known as Shinto). 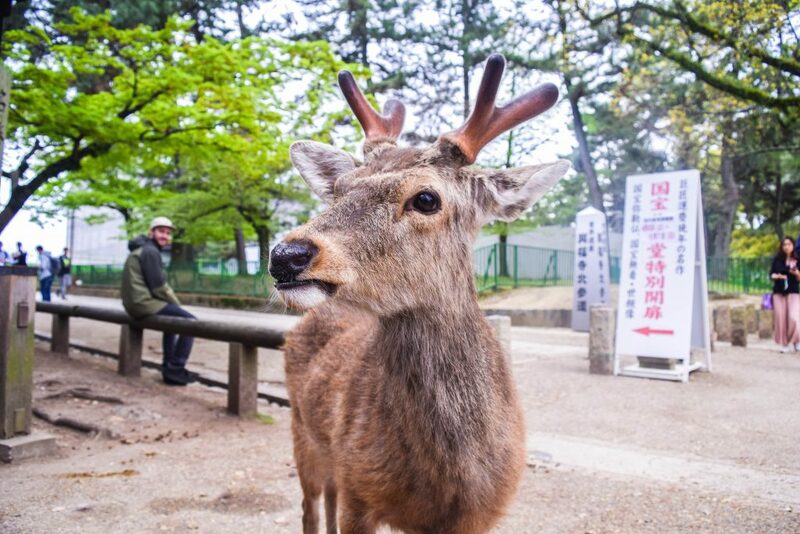 When you’re visiting Nara Park you can buy cookies almost everywhere to feed the deer. We saw that it went wrong a few times, as some deers can get a bit aggressive. If you have cookies, and a certain deer really wants it, he might bother you until you just drop them. Some deer are really polite though, as they bow to get cookies from you. We thought some deer looked a bit rough. This might be because some deer also fought each other to get cookies from tourists. Also, we want to add that it’s definitely possible to get photos of the deer without feeding them cookies. For instance, the shot above was of a deer that was very polite, looked healthy and not as if it fought a lot. We didn’t need any cookies to get his attention. Just some patience. Have you always wanted to try a real Japanese kimono, or experience a traditional Japanse tea ceremony? With this tour you can choose a kimono and you get dressed by a skilled fitter. Afterwards you ave a tea ceremony with a short explanation on this Japanese tradition! Pretty cool experience! Address: Nara Park is just a five minute walk from Kintetsu Nara Station. Be sure to check out our article with 14 Fun things to do in Kyoto! Kyoto is definitely one of the most fascinating places in Japan. There is just so much history and rich culture. There are many shrines, temples, palaces, gardens and so much more to explore. It’s worth at least a two day visit! Luckily, it’s easy to reach Kyoto from Osaka. Even if you’re not spending a night in Kyoto, you can purchase a two day train ticket and still explore as much as possible. There is so much to see in Kyoto and soon you can expect an article about Kyoto on our blog. 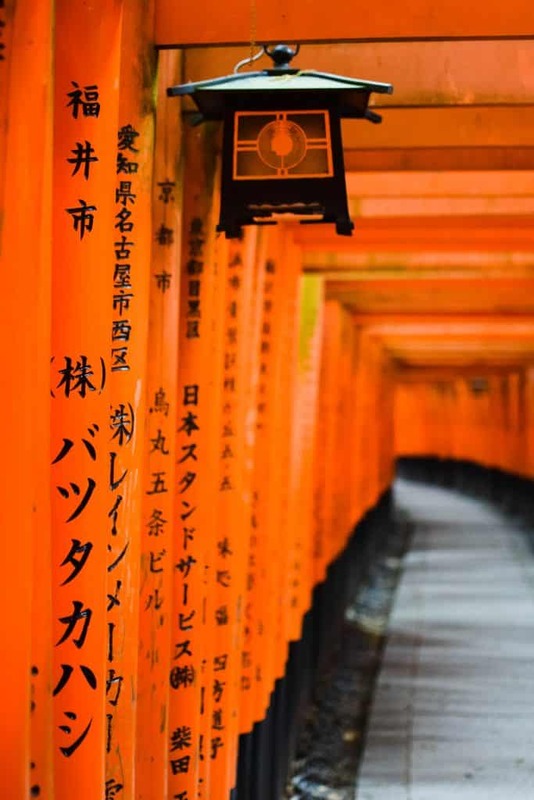 Some of the biggest highlights in Kyoto definitely are: Arashiyama bamboo forest, Gion district and Fushimi Inari Shrine. There are so many ways to go to Kyoto from Osaka, and even if you decide on taking the train there are still loads of possibilities. We found the sight seeing pass from Keihan Electric Railway useful and affordable. If you want everything sorted for you, check out this full day UNESCO and Historical Sites tour in Kyoto. It brings you to all the historical landmarks of Kyoto in one day, and includes a Japanese style lunch at Arashiyama. If you don’t like tours, don’t worry! It’s easy to explore Kyoto without one. If you don’t think Dotonbori resembles a fun amusement park enough, then you can always go to a real one. Universal Studios is a popular destination and we can understand why. It looks like a lot of fun. It has eight sections: Hollywood, New York, San Francisco, Jurassic Park, Waterworld, Amity Village, Universal Wonderland and The Wizarding World of Harry Potter. Be sure to spend a fun day at Universal Studios and skip the line at the entrance with this ticket by Get Your Guide. Address: 554-0031 Osaka Prefecture, Osaka, Konohana Ward, Sakurajima, 2 Chose. Opening hours: check out the changing opening hours here. Entrance fee: buy your 1 day-admission ticket here. Even just one night during your visit in Osaka should be spent in the tallest building of Japan: Osaka Marriott Miyako Hotel. After all the fun activities you can do during the day in Osaka, it’s certainly nice to come home to a relaxing accommodation. In Osaka we had one of the best stays during our travels so far. This certainly has something to do with the great view. 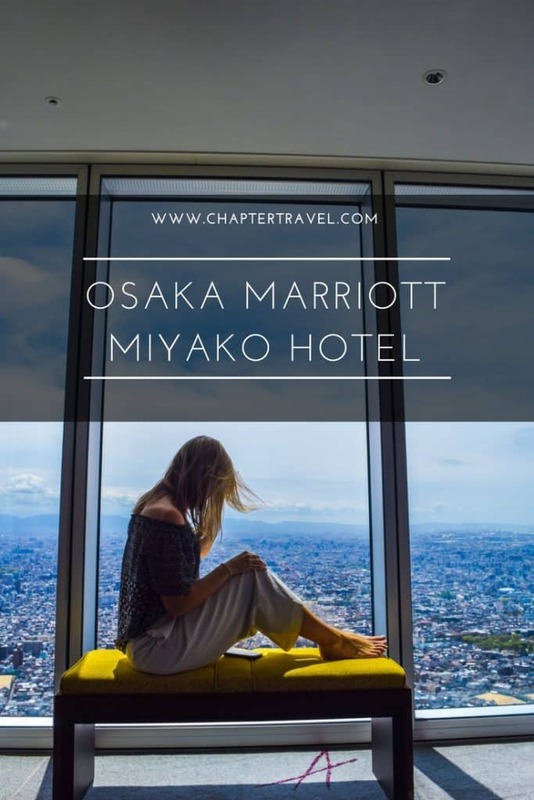 Even just one night during your visit in Osaka should be spent in the tallest skyscraper of Japan: Osaka Marriott Miyako Hotel. Lobby of Osaka Marriott Miyako Hotel. The lounge of Osaka Marriott Miyako Hotel. During our stay at Osaka Marriott Miyako Hotel, we definitely had the best view ever. This isn’t very strange, since it is located in Abeno Harukas, the tallest skyscraper in Japan. 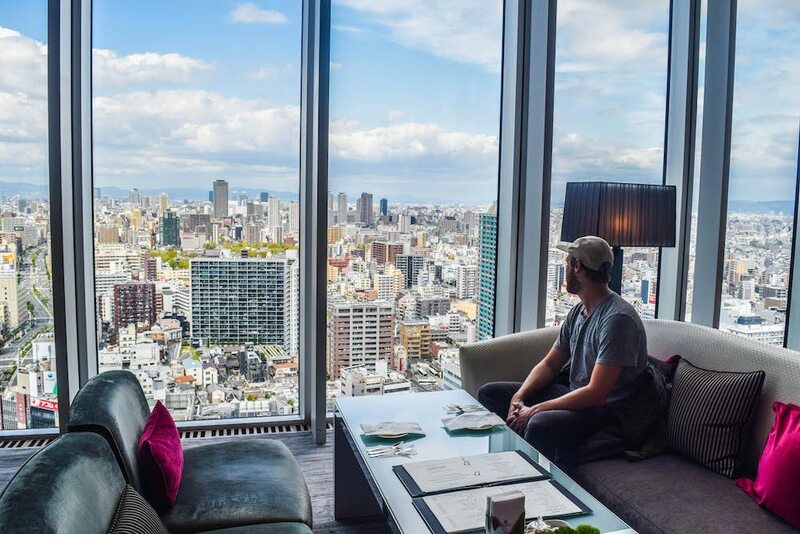 Our room was located on the 52th floor, and the floor to ceiling windows offered us an endless panorama over Osaka. The room was very comfortable and luxurious; we seriously slept like angels on the soft beds. The bathroom was amazing, and of course it included a bath tub with an outlook over the city. The facilities of the hotel include a club lounge, gym and business centre. As it’s located in the Abeno Harukas, you can also easily go to the Kintetsu Department Store, the Abeno Harukas Art Museum and eat and drink at various cafes and restaurants. Also, the Harukas 300 observation deck is worth a visit. 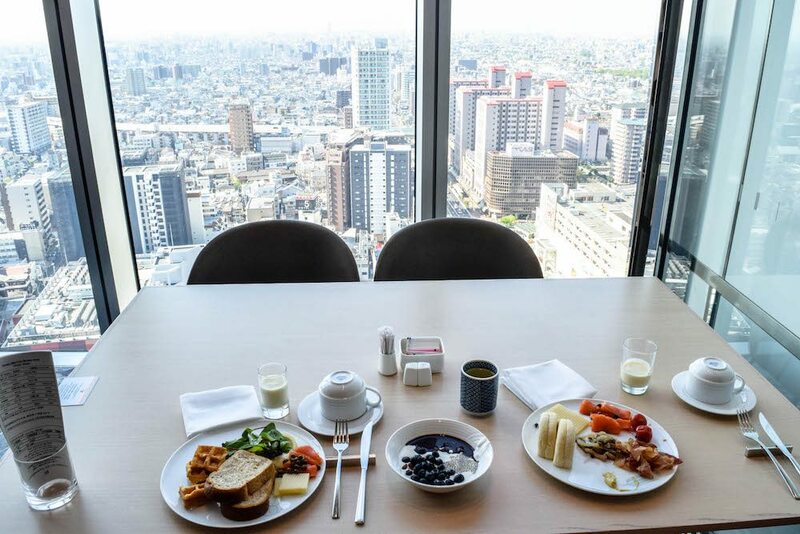 Of course, most rooms of Osaka Marriott Miyako Hotel already offer an epic view over the city. We still think it’s worth at least one visit during your stay. 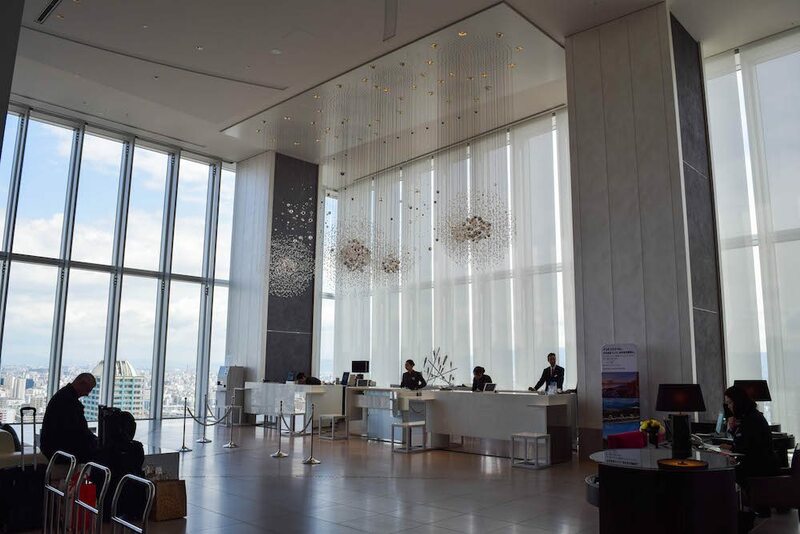 Luckily, Osaka Marriott Miyako Hotel offers it’s guests a free ticket to go to the observation deck and see a 360 view of Osaka. The location of Osaka Marriott Miyako Hotel is also excellent, with easy access to multiple tourist attractions. Some of the nearby sight seeing spots are Shinsekai, Shitennoiji Temple, Osaka Castle and Universal Studios. So far the Marriott Hotel chain always offers the best breakfast. This was proved yet again by Osaka Marriott Miyako Hotel. On the 19th floor there is a big buffet, with countless options. Besides Asian cuisine, there were also options such as pancakes, hash browns and more. We also think it’s good that there were so many healthy options, such as vegetables and lots of fruit. For more hotels in Osaka we recommend to check out TripAdvisor’s reviews to find the perfect hotel for your stay. Wow! What an excellent read! I’m also creating a travel website specifically for Japan, and your writing style and format is one of the best I’ve come across. I’ll be coming back to this site for inspiration for sure! I have that exact same picture of Shinsekai as one of my screen savers. I didn’t know what to expect of Osaka at all, but I loved it. Everywhere you look there’s something else mad – even the market is full of giant paper lobsters hanging from the ceiling. Your hotel looked amazing; bookmarking that for next time I go. Thank you for linking my USJ blog post! Your blog makes me want to go back to Osaka. I never got the chance to visit Minoo Park! That waterfall is lovely. Those views are incredible! Love all the colorful photos. I didn’t realize they had so many Michelin restaurants, so this will definitely be going on my travel list. I’m all about the food when traveling. Thanks Kate! We love trying out food too! Also, I love the accent of people living in Osaka! I’d love to visit the place, I pinned it for future my trip in japan, I’ll definitely take notes of your recommandations! The view from the the Harukas 300 is incredible, I love standing in skyscrapers to admire a city, it’s a must for me! And the Nara Park!! I’ve heard so much about this and I’m always so jealous when I see people’s pictures!! OMG! Osaka a place to die for! Hubby and I been planning to book there before the end of this year!!! I so love the place, can’t wait and by the way, pictures are beautiful! Hi Pammy, thank you so much :). Will be so exciting to go to Japan! Now I’d like to visit Osaka, it looks very interesting. I’ve only been to Tokyo, hope to discover more of Japan soon. Tokyo is fantastic too. We are also already thinking of going back and exploring more. We love Japan! I was in Osaka some years back and I absolutely loved my time there! We went to Kyoto on a day tour and that was wonderful too. I can’t wait to go back and do the rest of your suggestions! Kyoto is so great too :). We are actually writing a post about it right now. Thank you! Enjoyed your article a lot! Some cool ideas and really nice photos, I hope to get to Japan some day!